The blog entry was entitled, “Exercise & Eat Fruits & Veggies All You Want: You’re Still Going toDie.” While all of this may seem like common sense to some people, it does not seem apparent to everyone, including people who are geniuses in other aspects of life such as Steve Jobs. 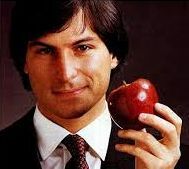 A new book on Steve Jobs by Walter Isaacson details some strange health habits he had which were clearly guided by false beliefs. To begin with, Jobs would consume a diet consisting only of a certain fruit or vegetable for weeks at a time, such as apples and carrots. The only reason I can think of that Jobs would do this is because he was told that apples and carrots were good for him and so he decided that if this was all he ate for a long period of time, that would be even better. However, while these foods have some positive qualities, they are not supposed to be the sole source of a diet. For example, while apples are a good source of vitamin C, vitamin A, and fiber, they barely contain any protein or fat and most of the calories come from sugar. No fat is a good thing you say. Not true if you have a diet that completely excludes fat because your body needs to use fat for energy storage. Not having enough protein is a major problem as well because proteins also provide energy, supports the growth of muscles and body tissue. Jobs reportedly also believed that his fruit, vegetable, nut, seed, and grain diet rid his body of toxins that would cause body odor. Thus, he felt there was no need to shower or wear deodorant regularly. Coworkers strongly disagreed. The irony of all of this is that the lack of certain proteins in a diet can interfere with detoxification and cause more bodily odor. No one can ever say for sure whether this type of extreme dieting contributed to Jobs developing pancreatic cancer but once he did develop pancreatic cancer, he again turned to diet and other alternative medicine techniques to treat the condition rather than conventional surgery that can offer a cure. These alternative techniques included the same type of diet noted above, acupuncture, online herbal treatments, and psychic consultations. The moral of the story is not to be extreme with your diet, eat sensibly, treat yourself once in a while, and if diagnosed with a serious medical illness, use common sense and mainstream science to guide treatment not unproven methods (such as treating Alzheimer’s disease with coconut oil) that lack peer-reviewed scientific support. Reference: MSNBC article by Melisa Dahl.